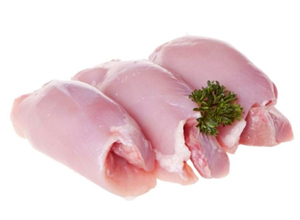 Chicken Thigh Boneless is a tasty and easy to cook. In fact, I find it difficult to mess up chicken thighs. They are just dark enough to stay tender, but not so dark as to put off people who prefer white meat. Everyone who eats regularly at my house has eaten chicken thighs.we can prepare lot of dishes using Chicken Thigh Boneless, it's also healthy and low calories. We can particularly used for honey Spice Chicken Thighs and shavarma .